A journalist working for the Guardian in Pakistan has been badly beaten by men in police uniforms, according to the newspaper. According to the report, Waqar Kiani, a 32-year-old local journalist, was stopped while driving through Islamabad and beaten with wooden batons and a whip. The alleged attack follows an account, written by Kiani and published five days before the attack, of torture and abduction by suspected Pakistani intelligence agencies. This is the second time that Kiani has been targeted, according to the Guardian, which reported last week that he was abducted from central Islamabad in July 2008 and taken to a safe house where interrogators beat him viciously and burned him with cigarettes. 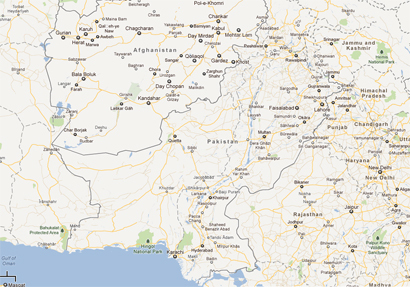 Pakistan was rated by the CPJ as the deadliest county for journalists in 2010, with eight confirmed killings. The country continues to be dangerous: Reporters Without Borders said in March this year that 13 journalists had been killed in the previous 13 months. Earlier this month, Pakistani journalist Syed Saleem Shahzad, who was investigating links between the military and al Quaeda before his death, disappeared. He was found dead two days later. Pakistan’s Inter-Services Intelligence agency has been widely accused of being behind the death but has fiercely denied any involvement. Two young Pakistani journalists, Shafiullah Khan and Abid Naveed, died after a double bombing in Peshawar on 11 June. This entry was posted in Journalism, Press freedom and ethics and tagged Pakistan, The Guardian, Wagar Kiani on June 20, 2011 by Joel Gunter. The New York Times has devoted this morning’s editorial to the death of Pakistani journalist Syed Saleem Shahzad. Shahzad, who was investigating links between the military and al Quaeda before his death, disappeared on Sunday. He was found dead on Tuesday. The Pakistani journalist Syed Saleem Shahzad knew he was a marked man. Mr. Shahzad, who covered national security and terrorism, had received repeated threats from Pakistan’s powerful spy agency. Yet he courageously kept doing his job — until somebody silenced him. His body, his face horribly beaten, was buried on Wednesday. Suspicion inevitably falls on Inter-Services Intelligence, Pakistan’s chief intelligence agency. For the sake of justice, and the shredded credibility of Pakistan’s government, his murderers must be found quickly and held accountable. Read the full editorial at this link. This entry was posted in Editors' pick, Press freedom and ethics and tagged editorial, isi, killings, New York Times, Pakistan, syed saleem shahzad on June 2, 2011 by Joel Gunter. (Via @frontlineblog) Report on the declining number of female journalists in Afghanistan, forced out of the profession by threats; and the plight of female journalists in neighbouring Pakistan, who face restrictions because of their gender. This entry was posted in Editors' pick, Press freedom and ethics and tagged Afghanistan, Epoch Times, Pakistan, women on May 19, 2009 by Laura Oliver.